This place is a throwback. When it was renovated a while back, it just got even more kitchy. While the food is ordinary (with the exceptions of the waffles), the helpings are generous and so is the staff and the crowd. 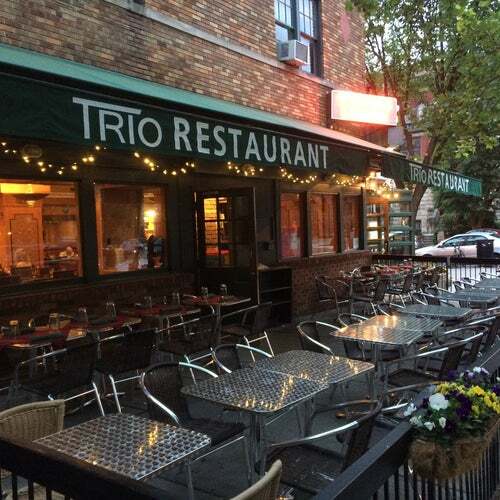 For years, Trio has gotten away with an ordinary menu based on location and the smiles. It's packed on the weekends, and get there early for Sunday brunch to get a table in the covered patio right on 17th Street. poster child for gay clubs. Okay. Very Friendly and great food!! Went to Hanks and there kitchen had just closed so we walked next door to Trio. When walking in at 10:10 they were happy to see us and gave great service. Food was Delicious!! Food was good. Best crab cakes in town! Good portion size. Friendly staff.